I honestly think that I'm not exaggerating. I do believe that this is the prettiest ukulele I have ever seen. The inlays are incredible! I was just wandering through eBay while I was drinking a cup of tea (I'm freaking still getting over this cold) when I see this MAKANI SURF TENOR UKULELE FULL KOA CUSTOM by Kazu Mori. Reading the auction notes, this ukulele looks to be custom built by Kazu Mori. Apparently Kazu's father is a master builder himself. The wood is Koa and there are beautiful inlays all over this thing. Check out the surfer near the sound hole. Also, there are abalone fret markers and the neck is bound in ebony? Dang! Unless I hit the lottery, I'm going to have to live with just looking at the pictures. But, the pictures are so pretty that I might be able to live with that. Also, if I did own this thing I'd almost be afraid to touch it, let alone play it. It's like skateboarding on the roof of the Sistine Chapel or something. Lanikai LU-21TE Acoustic-Electric Tenor Ukulele Rosewood Fretboard. It's only $99.99 and that includes free shipping! Also, there are 10 reviews and the average rating is 4 1/2 stars! Someone was just asking me, on Twitter, about good deals on Tenor ukuleles. Well, this is it! You need this one! The Lanikai Tenor Ukulele features Shadow electronics for rich, amplified tone. It has Nato top, back, and sides. Rosewood fingerboard and bridge with die-cast geared tuners and binding on the top. Lanikai ukuleles including the LU-21TE uke, have great playability, sound, and aesthetics at a price that will surprise you. I, personally, own a Lanikai tenor acoustic-electric and I love. But, I'm pretty sure I paid $399 for mine. Dang! Update: Some of the reviews of the pick-up in this ukulele aren't especially favorable, which is weird because the overall ratings are very high. But, I think this is boiling down to price. 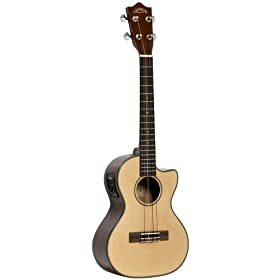 It's a little bit tricky to find a tenor acoustic/electric ukulele for under $200. The other Lanikai model that hits this price point is the Lanikai S-TEQ. But at $189, it's nearly double the price of the Lanikai LU-21TE over at Musician's Friend. Also, after doing some reading, I believe that it uses the same pick as the LU-21TE, so it might not be the best way to spend your extra $99. 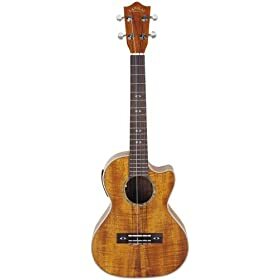 To make it more confusing, if you want to spend a little bit more, you could get the exact ukulele that I own, the Lanikai CK-TEQ. Now, I know that $279 is a lot of money, but it's only $90 more than the Lanikai S-TEQ, albeit it's $180 more than the Lanikai LU-21TE. I've owned my CK-TEQ for something like 5 years and I play it almost every day. I love it to death! So, I'm not sure if that makes your decision any easier, but it looks like the world isn't exactly overrun with budget acoustic-electric ukuleles. And, that's unfortunate. I can tell you that the CK-TEQ doesn't use the same pickup system as the other two ukuleles. Mine uses a 9-volt battery, and not a watch battery and I don't have any complaints with it. I like the sound I get out of it when I go into an amp or PA. Anyway, I wish you the best on your acoustic-electric tenor ukulele purchases. It might be time to talk to Santa, right?